Wednesday March 12th 1879. Mother started to go to the valley this morning and had only started when Mrs Middleton came. In a little while she came back with Grand-ma and Aunt Em she had met them. We had a nice visit Win was over and stayed till after supper and Hatt went home with her. Lee took Mrs Middleton home in the buggy. I wrote a letter to Ira in the evening. Thursday March 18th 1879 I did the ironing this morning and in the afternoon and evening worked on my tidy Auntys Walker and Holmes with Mrs Wildes spent the afternoon here. It stormed so I could not go over to prayer meeting tonight. 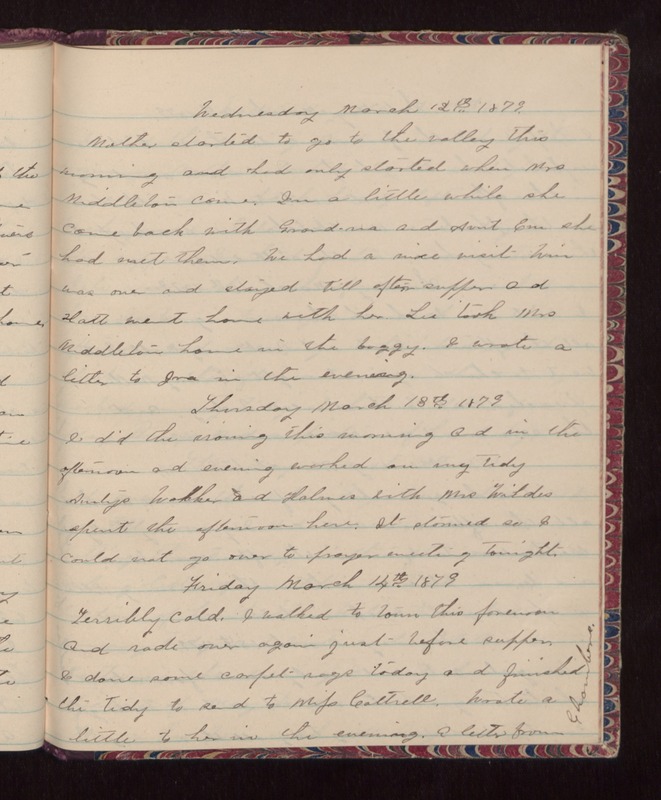 Friday March 14th 1879 Terribly cold. I walked to town this forenoon and rode over again just before supper. I done some carpet rags today and finished the tidy to send to Mifs Cattrell. Wrote a little to her in the evening. A letter from Chambers.